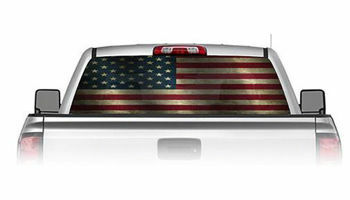 American Flag with a grunge old look see through window graphic from Weston Ink will make your truck look awesome and others will envy you. Easy to install because of it's design and material. The tiny holes that give it the view through property make it virtually impossible to get an air bubble with this decal during installation. This graphic will make your truck look great and still allow you to use your back window view without blocking it.